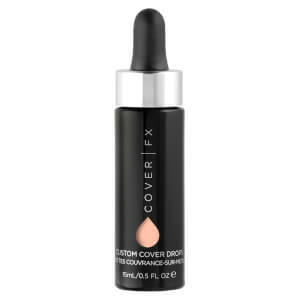 Perfect your complexion with the Cover FX Power Play Concealer, a full coverage concealer with naturally radiant finish. The vegan concealer delivers weightless full coverage to conceal and blur the appearance of dark circles, blemishes and imperfections. Blending seamlessly, the fluid concealer is available in a diverse range of shades for concealing, contouring and highlighting. Applies effortlessly and provides all-day crease-proof, transfer-proof and colour-true wear. Free from parabens, fragrance, gluten, mineral oil, talc, gluten, sulphates and phthalates. To Highlight: Choose a concealer 1-2 shades lighter and dot over the high points of the face including the top of the cheek bones, bridge of the nose, brow bones, cupid’s bow, and centre of the forehead. To brighten the under eye area, dot in a triangle of light formation. Blend with a wet sponge. Water/Aqua/Eau, Cyclopentasiloxane, Glycerin, Hydrogenated Polydecene, Cetyl Peg/Ppg-10/1 Dimethicone, Niacinamide, Synthetic Fluorphlogopite, Magnesium Sulfate, Sorbitan Sesquioleate, Dimethicone, Aminopropyl Dimethicone, Polymethylsilsesquioxane, Polyglyceryl-4 Isostearate, Alumina, Phenoxyethanol, Disteardimonium Hectorite, Cera Microcristallina/Microcrystalline Wax/Cire Microcrystalline, Silica, Dimethicone Crosspolymer, Ethyhexylglycerin, Glyceryl Caprylate, Triethoxycaprylylsilane, Adenosine, Butylene Glycol, Alteromonas Ferment Extract, Albizia Julibrissin Bark Extract, Darutoside, May Contain: Titanium Dioxide (Ci 77891), Iron Oxide (Ci 77491, Ci 77492, Ci 77499), Chromium Oxide Greens (Ci 77288).